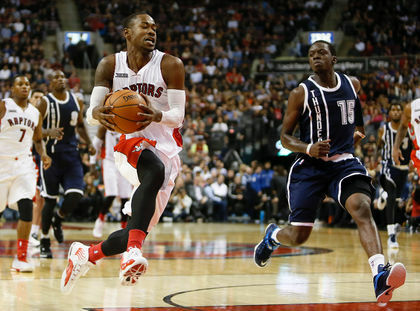 The inclination is to declare Terrence Ross out of hibernation and ready for the stretch run. Were he a tad more consistent, and we a tad less jaded, that would be the course of action today. But Ross, like many of his teammates, struggles with consistency. The evidence Sunday night in Oklahoma City suggests Ross has relocated his stroke and with it the confidence within himself and from his teammates to be a contributing member of that starting five that he rejoined in Charlotte. Ross will tell you his confidence has never wavered, nor has his teammates’ confidence in him. And maybe he believes that, but it doesn’t pass the eye test. There are games where he shoots with confidence and in rhythm like Sunday. And then there are games where you hardly notice him, like too many times before. This is not to pick on Ross. He is not alone in his inability to consistently deliver what his team needs of him. And while inconsistency is a part of professional sports, there’s just too much of it going on right now with the Raptors. While Ross was looking every bit the answer to what ails the Raptors on Sunday night in Oklahoma City, both Amir Johnson and Jonas Valanciunas were having the exact opposite kind of night. Neither was contributing much of anything on the offensive end and the thought of pulling down a rebound seemed to be beyond both of them. They both had off nights. DeMar DeRozan seems to be the one consistent in the lineup these days and it’s not that long ago that he was struggling. Everyone seems to be taking a turn and often it’s more than one guy on the same night. This team can be good. The proof is in the record. They’re just not good enough to sustain that kind of drop-off from 40% of the starting five on any given night. We’ll cut Kyle Lowry a little slack here because he’s just back and finding his way after a three-game absence, but he needs to get it going soon, too. Tuesday night against the Spurs will mark the third game of his return. Casey used Sunday’s game as an example of what happens to the team when more than one of its key minutes eaters is not delivering on the same night. But with both struggling and the Thunder bigs — Serge Ibaka and Enes Kanter — on top of their games, not even an above-average shooting night from Ross was enough to turn things in Toronto’s favour. It’s all a big part of this dip the team finds itself in these days having lost eight of its past nine. Casey maintains all is not lost, and, in reality, how could it be? Regardless of what the Raptors do the rest of the year, they are going to start the playoffs no worse than the No. 4 seed in the East. But he quickly shot down any question of his team losing its moral of chemistry through this bad time. DeRozan, who is averaging 28.5 points a night in March compared to the 16.7 he was scoring in February, thinks the team is close to putting it all together. It would be nice if that would happen soon, given the Raptors have just 19 games before the playoffs begin, but it won’t be easy, as Casey points out. The Spurs, who provide the opposition Tuesday, certainly fit that bill. Terrence Ross never really felt uncomfortable in the second unit. But he didn’t like the shooting slump he was in. Ross said it was just a matter of getting back into the gym and putting in some more work and that’s what he did in Charlotte when he returned to the starting five. Ross isn’t picky. He’ll hit the gym with assistant Bill Bayno, or Jama Mahlalela, or anyone willing to rebound for him. It has worked before and it worked for him heading into Oklahoma City, where he hit six of his nine three-point attempts for his first 20-point night in over a month and only his second in the calendar year. Unfortunately for the Raptors, as good as the ball movement was in the first half — 18 assists on 24 made field goals — it dried up in the second with just six assists on 18 makes.